A cask conditioned real lager. Brewed with lager malt and a traditional lager yeast. Crisp, dry with a hint of sweetness. Light apple and melon flavours with a balanced soft bitterness from the American Ahtanum hops. Flavourful and refreshing but never shaken or stirred! Awesome! From someone who is fussy about lager, not being a lager drinker, this was an amazing find! So much flavour and so drinkable. This is a lager for beer lovers! Top notch. Thank you tripplefff! 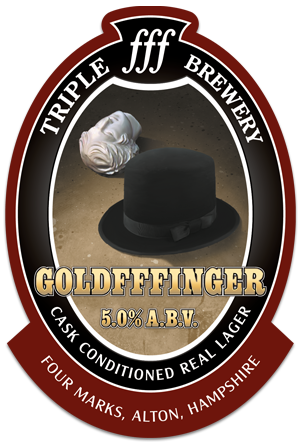 Just sampled your rather wonderful Goldfffinger real lager at the Grain and Grape real ale festival Crystal Palace. In what is rapidly becoming a crowded market of "hipster" craft beer your offering stands out as an example of what can be produced by a 21st century brewer who genuinely knows what a great beer should look, smell and taste like. More please!! !